After Minecraft, one game that has taken the world of children by storm is Five Nights at Freddy’s, better known as FNAF. This media franchise, based on indie video and created by Scott Cawthon, centers on the story of a restaurant named Freddy Fazbear’s Pizza and its titular character, Freddy. 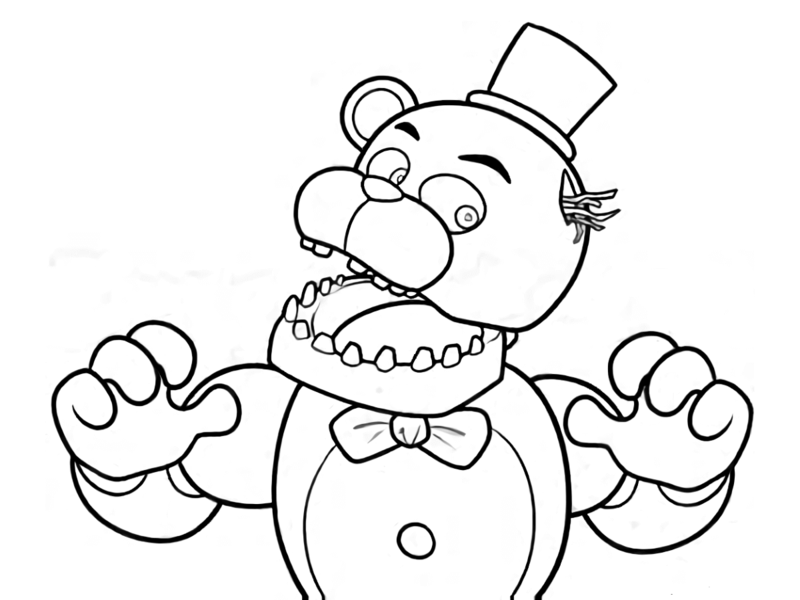 Since this franchise is so popular, we decided to get our readers a list of Five Nights at Freddy’s coloring sheets. 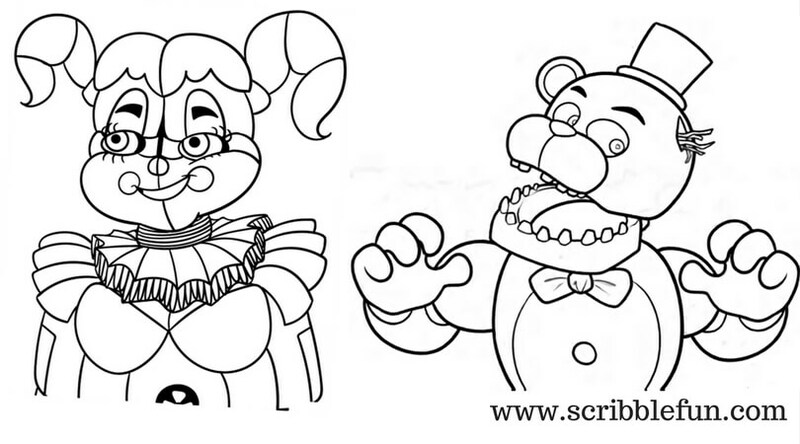 Check out our list of free printable Five Nights at Freddy’s coloring pages of FNAF coloring pages below! 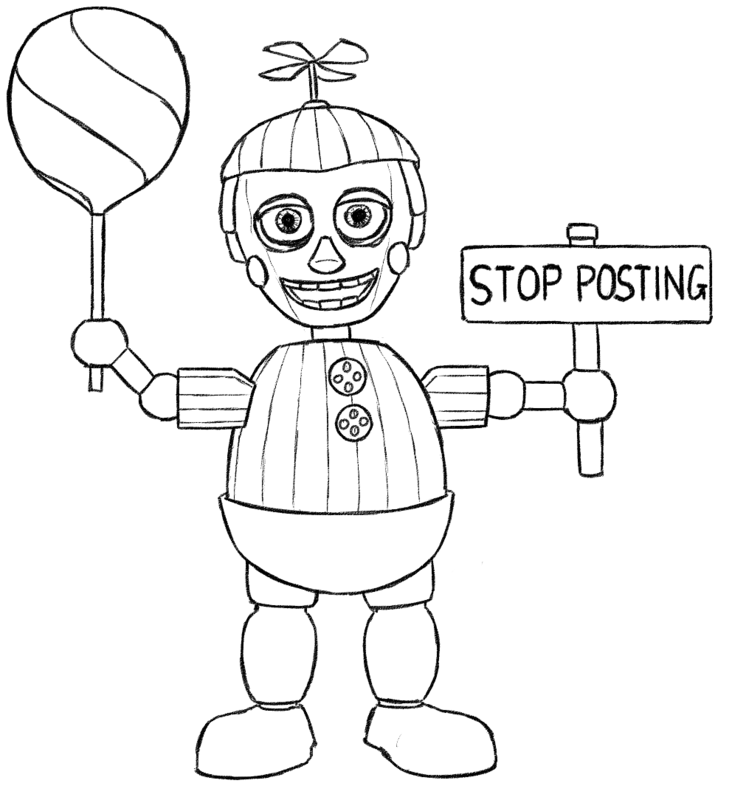 Here’s a coloring page of the dreadful Phantom Balloon Boy, better known as Phantom BB in “Five Nights at Freddy’s 3”. This antagonist is almost same as BB, but lacks eyes and two white buttons. Instead, he has two, white pupils, just like Springtrap. Meet Bonnie, also known as Bonnie the Bunny or Bonnie the Rabbit in “Five Nights at Freddy’s”. 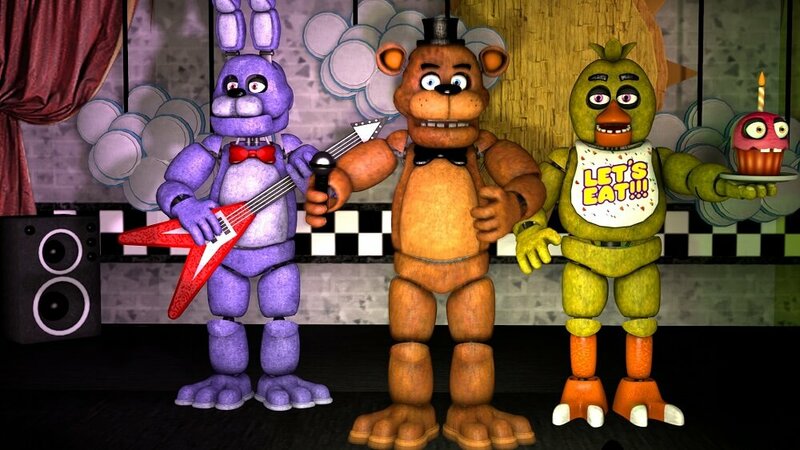 Being a guitarist, Bonnie stands on the left side of the band. Bonnie is a purple colored rabbit with squarish muzzle and magenta eyes. 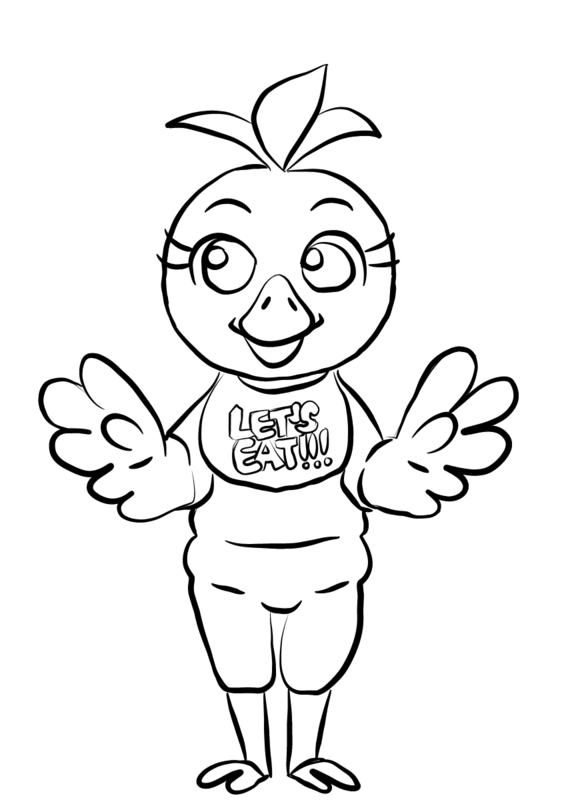 Meet Chica, officially known as Chica the Chicken, the animatronic chicken at Freddy Fazbear’s Pizza. She’s the backup singer of Freddy’s band and forcefully tries to stuff humans into Freddy Fazbear’s suit, which results in their death. Meet Circus Baby, also known as Baby in this video game. She is focal animatronic in “Five Nights at Freddy’s: Sister Location” and the mascot of Circus Baby’s Pizza World. She wears a childlike red dress, red shoes and always holds a microphone in hand. 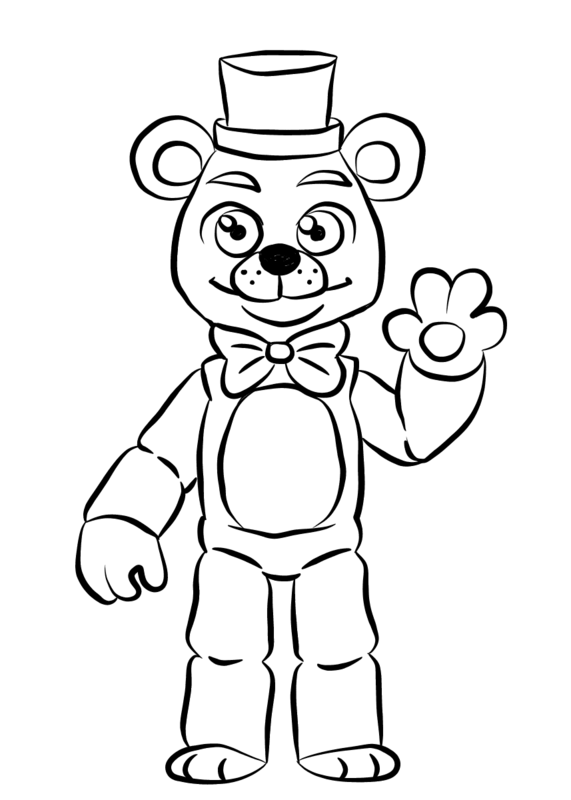 Here’s a cute coloring page of Freddy Fazbear, the titular character and the main antagonist of “Five Nights at Freddy’s”. He is an animatronic bear and the mascot of Freddy Fazbear’s Pizza. 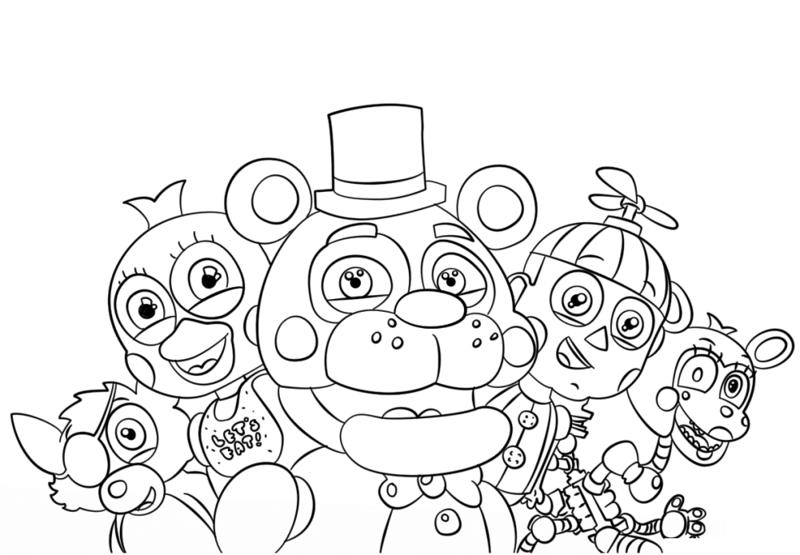 Here we get the most awaited Five Nights at Freddy’s characters coloring Page. It features all the bcore characters of this series. 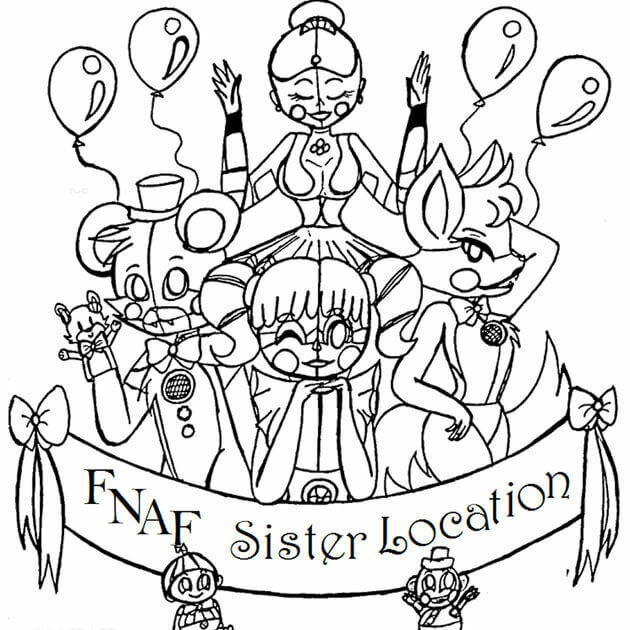 Here’s a coloring page of Five Nights at Freddy’s: Sister Location, which is the most recently release game in the Five Nights at Freddy’s series. It features Circus Baby in her Pizza World along with other important characters. 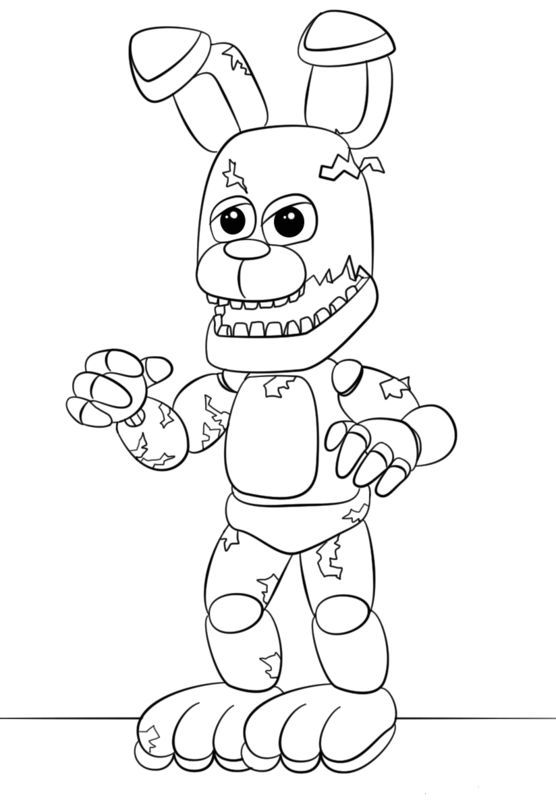 This coloring page features the fearful Springtrap, a terribly damaged rabbit, who happens to be the main antagonist of the “Five Nights at Freddy’s 3”. Springtrap can kill any player and end the game for them. Here’s a coloring page of a Toy Bonnie, a bright blue colored bunny with green eyes and buck teeth. Unlike the original Bonnie, Toy Bonnie has bunny teeth and a white circular tail, which is visible only when he crawls through Right Air Vent. Meet Toy Chica, one of the latest animatronics in “Five Nights at Freddy’s 2”. It’s a typical feminine character, which orange fur, orange beak, blue eyes, orange feet and long eyelashes. She even has blushed pink cheeks. Meet Foxy the Pirate, better known as just Foxy in FNAF. He stands behind the Curtain in Pirate Cove, from where he emerges and sprints attach the night guards. Foxy may even hide for a while before attacking the night guard. 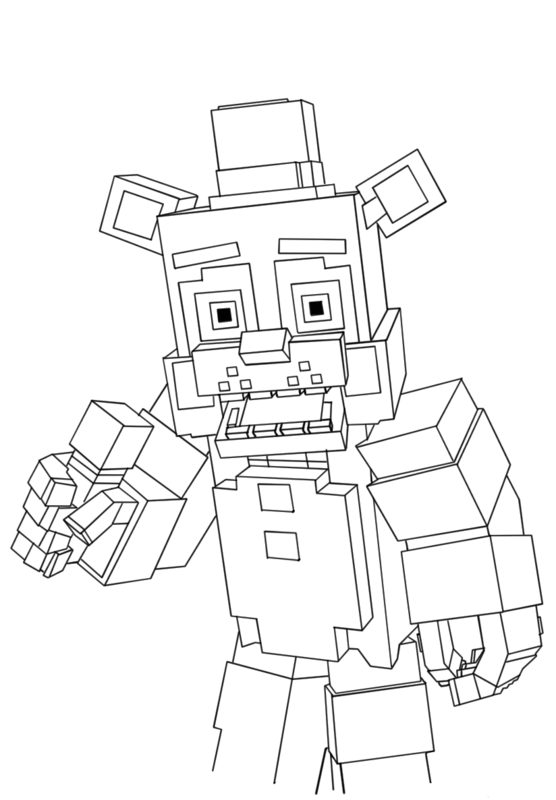 Here’s a coloring page of Golden Freddy, who is also referred to as Yellow Bear. This secret, golden colored version of Freddy is the antagonist and appears in the office only when the certain sequence of events has been triggered. 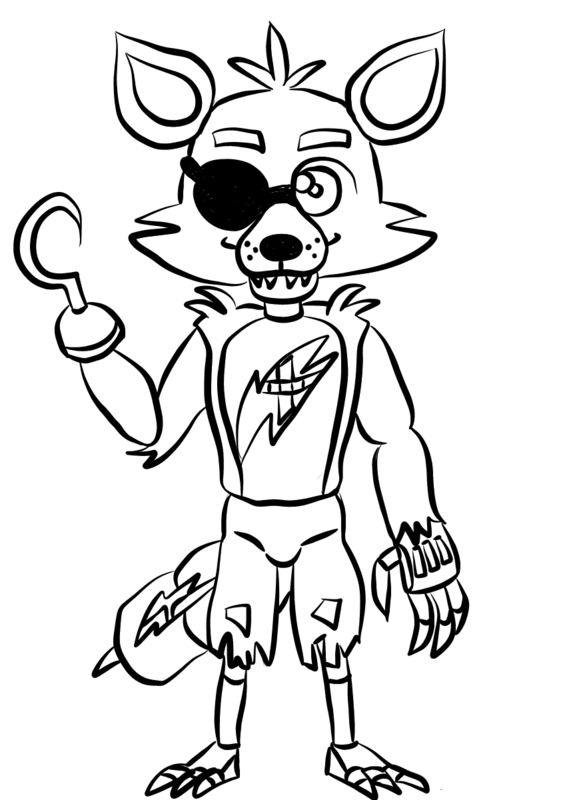 Here’s another coloring page of Foxy, the pirate in full mood to stuff humans into Freddy Fazbear suit. This animatronic fox has tattered, crimson colored hair, yellow eyes and red eyebrows. 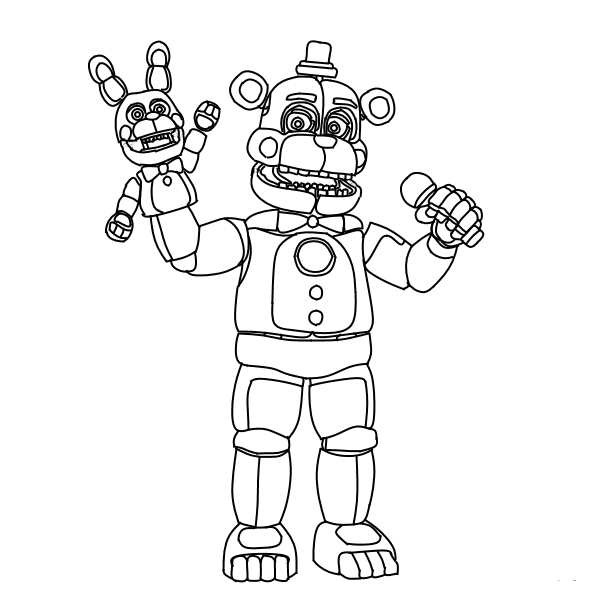 Here’s a coloring page of the happening duo, Freddy and Circus. These two never fail to have their shares of fun in the Pizza World, stuffing and killing human and they seem to be in full mood in this coloring page as well. Here’s another coloring image of Freddy. 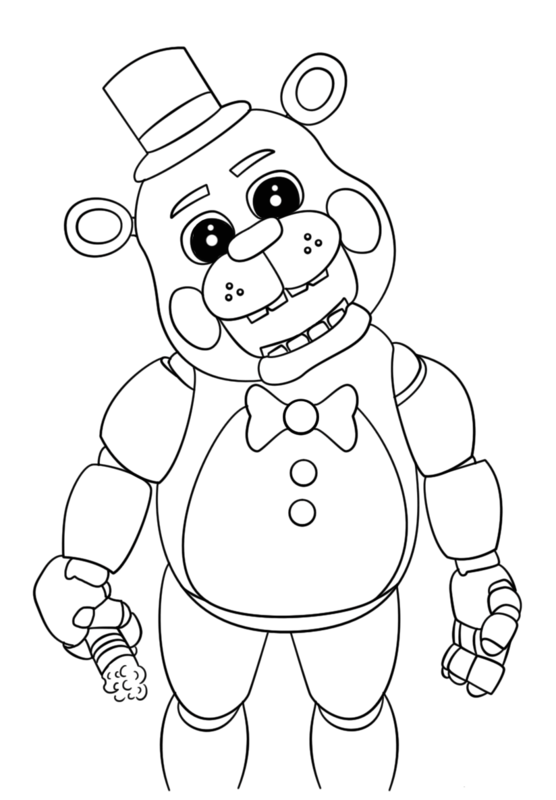 Freddy may look cute in this coloring page, but he’s quite a dangerous character. He tries to forcefully stuff any human he can lay his eyes on into Freddy Fazbear’s suit, which results in death. 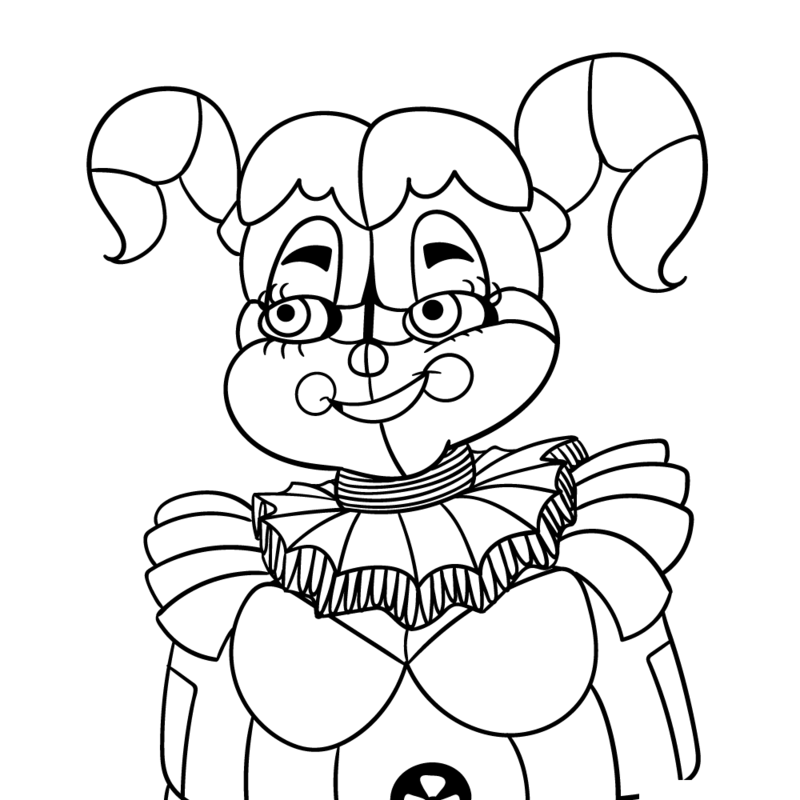 This coloring sheet features the funtime version of Foxy, also known as Funtime Foxy. We totally love Foxy is this avatar. His appearance is basically a combination of Mangle and Foxy, with its pink and white color scheme. And it’s completely repaired too! 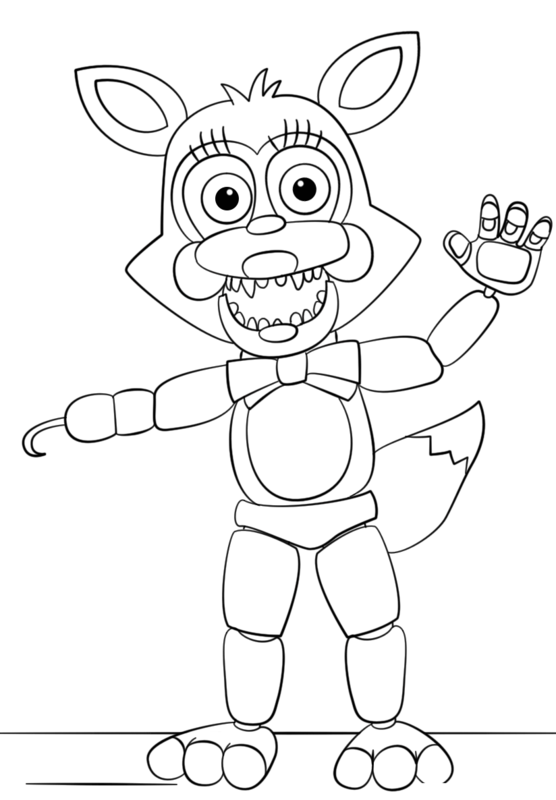 Here’s another coloring page of Funtime Foxy and we must say he’s looking very cool, happy and jovial in this coloring sheet. It’s quite a break from the regular, menacing Foxy we generally get to see. 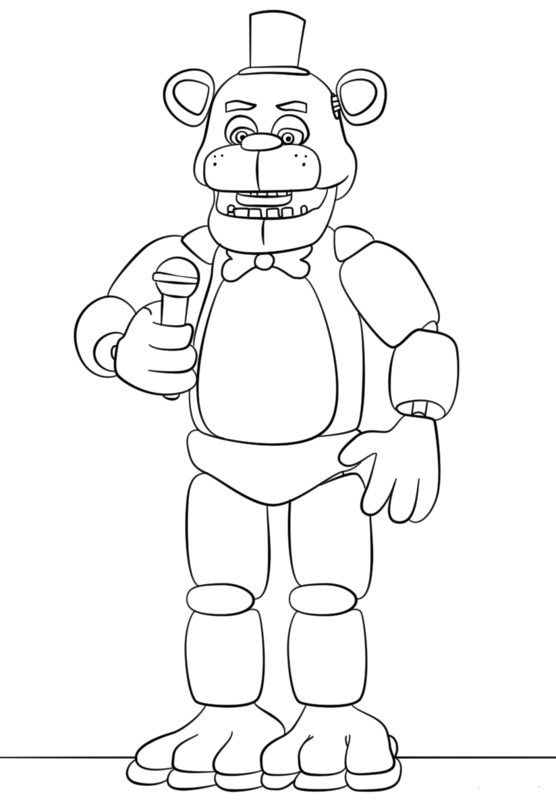 Meet the Funtime version of Freddy, who is also one of the entertainers of the Funtime Auditorium. The design of Funtime Freddy is also very cool, with metal suit, blue eyes and thinner eyebrows. He also wears his signature top hat in this form. 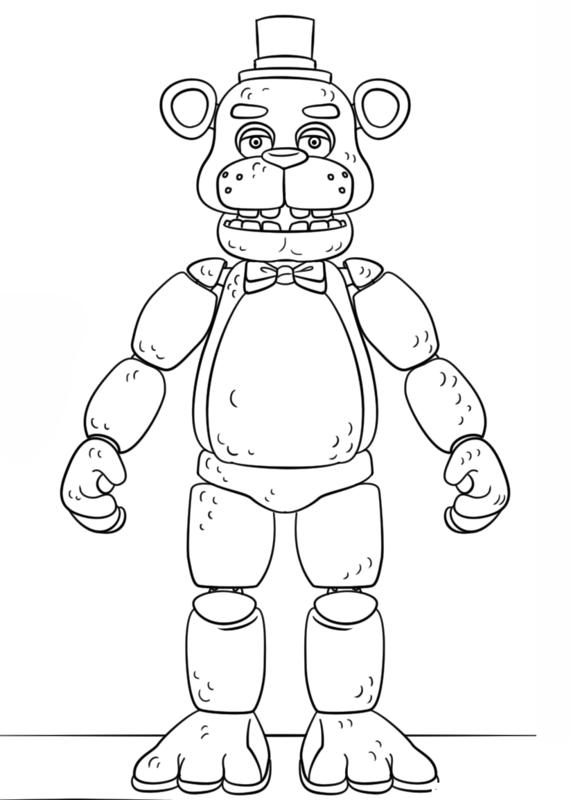 This coloring page features Helpy, a plush like character, featuring in “Freddy Fazbear’s Pizzeria Simulator”. He’s a white and purple character, similar to Funtime Freddie, but chubbier and smaller. We love how he hops in excitement. If you are a Minecraft lover, you’re sure to love this Minecraft version of Freddy. 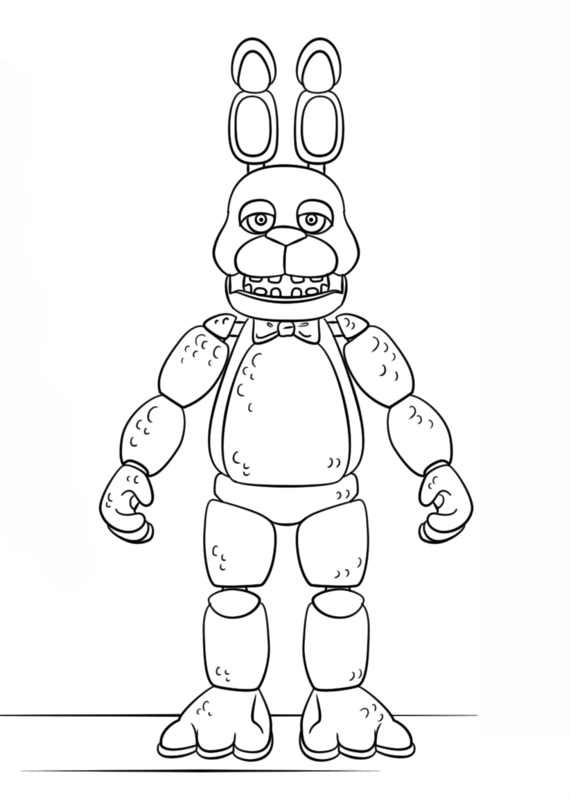 It’s quite unlike other FNAF coloring pages we’ve seen and that’s precisely what makes it stand out. 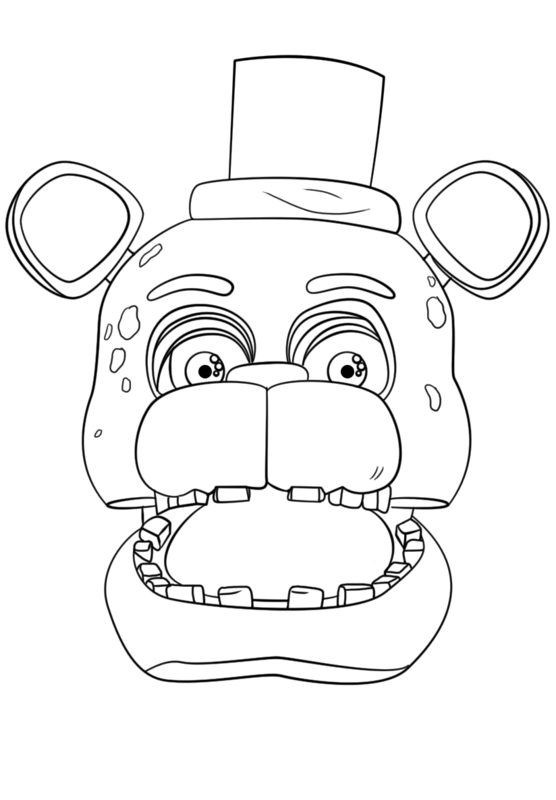 Here’s another wonderful coloring page of Freddy and he’s not looking menacing even a wee bit. Instead, he’s looking very adorable and can trick even the smartest ones with his looks. 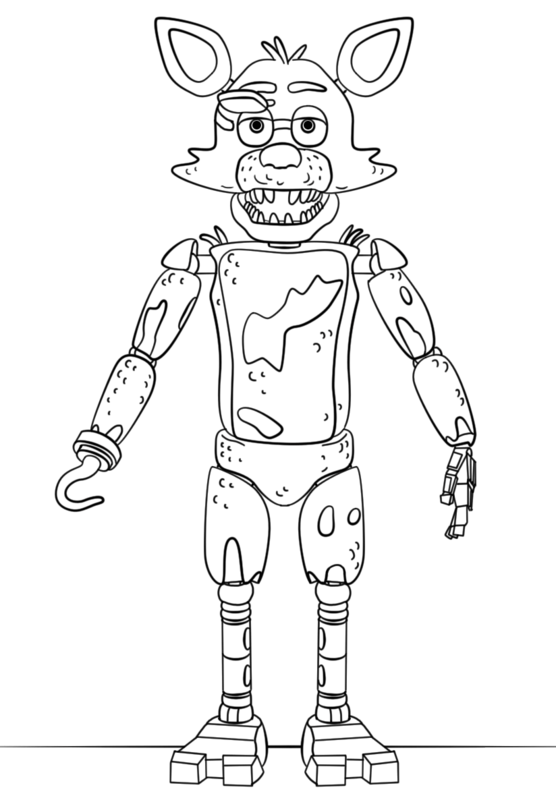 Here’s a coloring page of Lefty, the salvageable animatronics of FNAF. He is a black or dark gray colored character with light gray chest. He always wears a red top hat, knee caps and a bowtie. 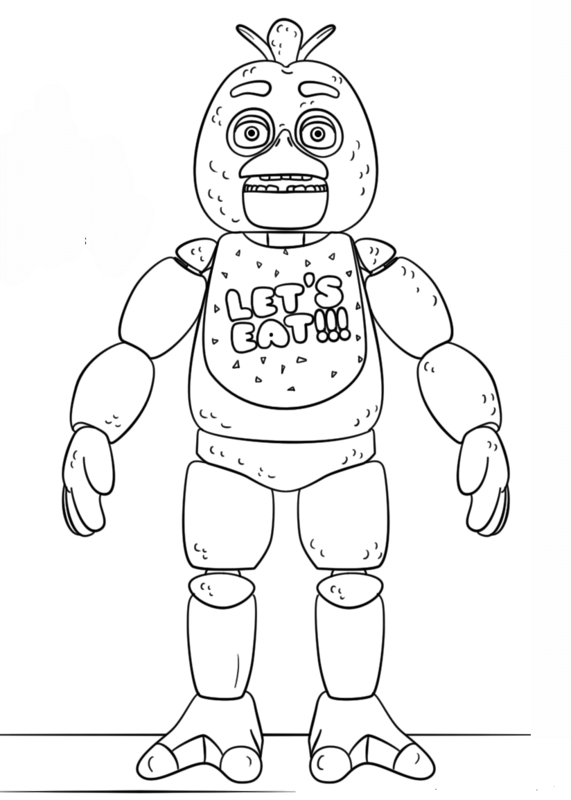 Here’s a coloring page of Nightmare Chica, the nightmare incarnation of Chica. She hunts for the humans from the right side of the building. 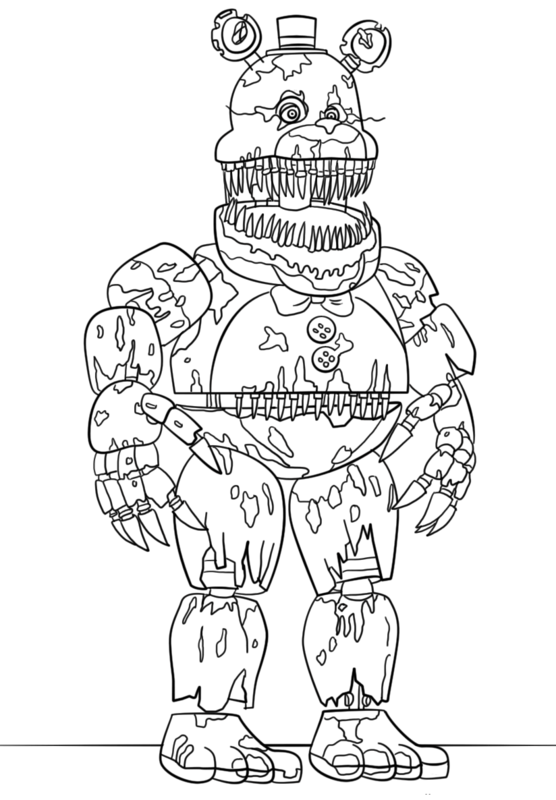 Here’s a coloring page of Nightmare Freddy, one of the seven nightmare animatronics in the game, “Five Nights At Freddy’s”. Nightmare Freddy is totally tattered, with bulky arms always stretched. 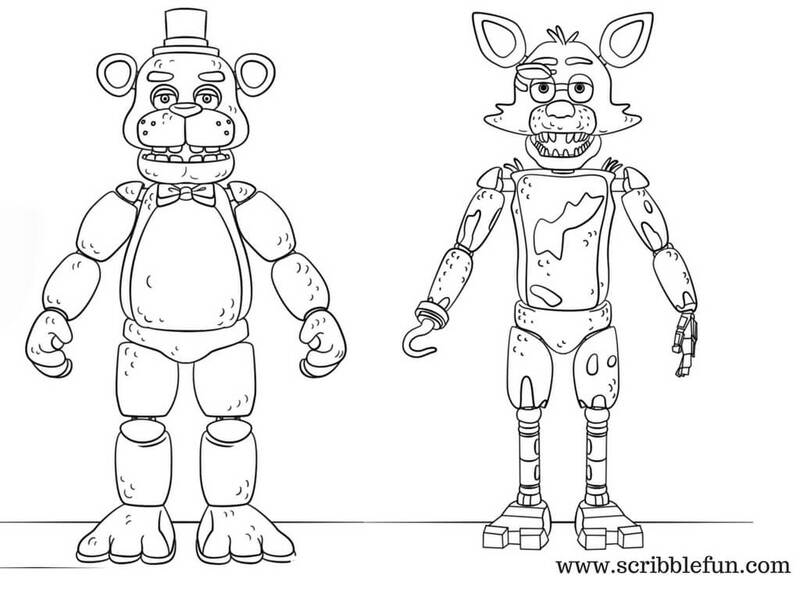 Here’s a lovely FNF coloring page of Toy Fox and Golden Freddy waiting to be colored. So why the delay? Get your pencil or watercolor and start coloring soon! 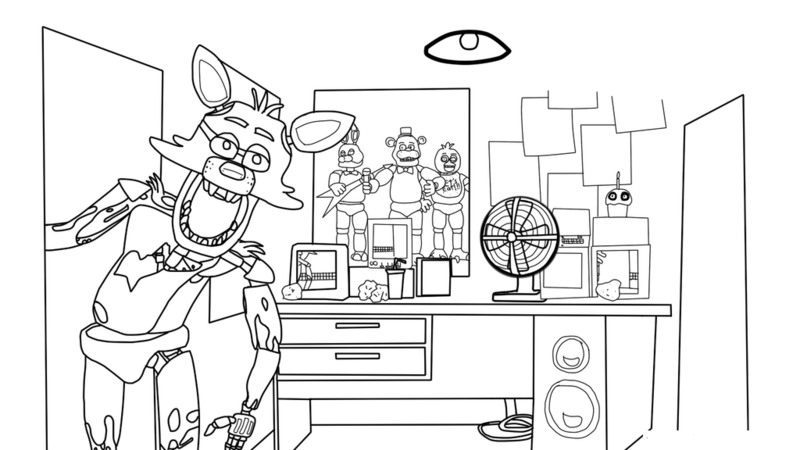 So these were 25 of the best Five Nights at Freddy’s coloring pages. We are sure you will enjoy coloring them as much as you enjoy playing this game. What more? 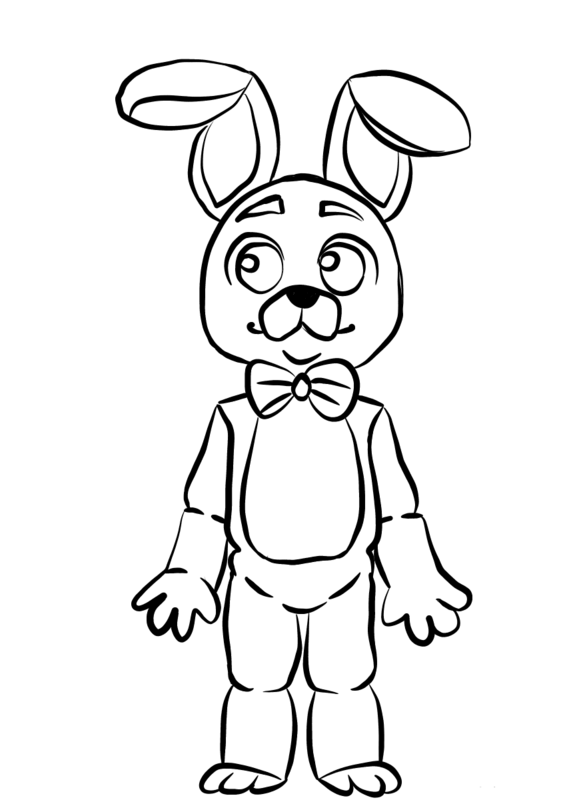 All these FNAF coloring pages are neat and clean and will look beautiful when filled with dark and vibrant shades. 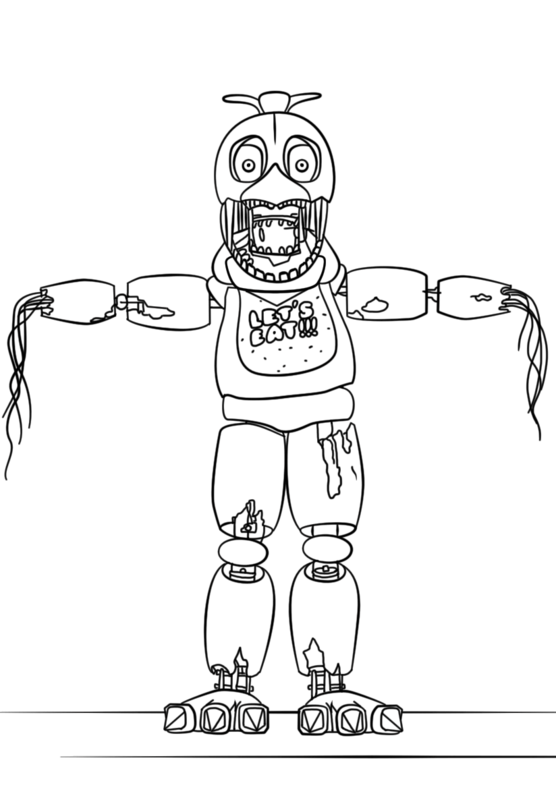 So print out all these Five Nights at Freddy’s coloring sheets right away. And don’t forget to check out our unicorn coloring pages too!